We left Paul on that voyage which his friends induced him to undertake on the flight from Berea. The vessel was last seen among the Thessalian islands. About that point the highest land in Northern Macedonia began to be lost to view. Gradually the nearer heights of the snowy Olympus itself receded into the distance as the vessel on her progress approached more and more near to the center of all the interest of classical Greece. For a distance of ninety miles, from the confines of Thessaly to the middle part of the coast of Attica, the shore is protected, as it were, by the long island of Euboea. Deep in the innermost gulf, where the waters of the Aegean retreat far within the land, over against the northern parts of this island, is the pass of Thermopylae, where a handful of Greek warriors had defied all the hosts of Asia. In the crescent-like bay on the shore of Attica, near the southern extremity of the same island, is the maritime sanctuary of Marathon, where the battle was fought which decided that Greece was never to be a Persian Satrapy. What made Athens unique in the world? How many books did Paul write? First century churches started on islands! Attica is a triangular tract of country, the southern and eastern sides of which meet in the point of Sunium; its third side is defined by the high mountain ranges of Cithaeron and Parnes, which separate it by a strong barrier from Boeotia and Northern Greece. Hills of inferior elevation connect these ranges with the mountainous surface of the southeast, which begins from Sunium itself, and rises on the south coast to the round summits of Hymettus, and the higher peak of Pentelicus near Marathon on the east. Athens and the Piraeus must never be considered separately. One was the city, the other was its harbor. Once they were connected together by a continuous fortification. Those who looked down from Lycabettus in the time of Pericles could follow with the eye all the long line of wall from the temples on the Acropolis to the shipping in the port. Thus we are brought back to the point from which we digressed. We were approaching the Piraeus and, since we must land in maritime Athens before we can enter Athens itself, let us return once more to the vessel's deck, and look round on the land and the water. The island on our left, with steep cliffs at the water's edge, is Aegina. The distant heights beyond it are the mountains of the Morea. Before us is another island, the illustrious Salamis; though in the view it is hardly disentangled from the coast of Attica, for the strait where the battle was fought is narrow and winding. The Piraeus, with its suburbs, was given to Athens as a natural advantage, to which much of her greatness must be traced. It consists of a projecting portion of rocky ground, which is elevated above the neighboring shore, and probably was originally entirely insulated in the sea. The two rivers of Athens, the Cephisus and Ilissus, seem to have formed, in the course of ages, the low marshy ground which now connects Athens with its port. The port of Athens itself possesses all the advantages of shelter and good anchorage, deep water, and sufficient space. Themistocles, seeing that the pre-eminence of his country could only be maintained by her maritime power, fortified the Piraeus as the outpost of Athens, and enclosed the basin of the harbor as a dock within the walls. In the long period through which Athens had been losing its political power, these defenses had been neglected and suffered to fall into decay, or had been used as materials for other buildings: but there was still a fortress on the highest point; the harbor was still a place of some resort; and a considerable number of seafaring people dwelt in the streets about the seashore. When the republic of Athens was flourishing, the sailors were a turbulent and worthless part of its population. And the Piraeus under the Romans was not without some remains of the same disorderly class, as it doubtless retained many of the outward features of its earlier appearance. Had Apostle Paul come to this spot four hundred years before, he would have been in Athens from the moment of his landing at the Piraeus. At that time the two cities were united together by the double line of fortification, which is famous under the name of the "Long Walls." The space included between these two arms of stone might be considered (as, indeed, it was sometimes called) a third city; for the street of five miles in length thus formed across the plain was crowded with people, whose habitations were shut out from all view of the country by the vast wall on either side. Some of the most pathetic passages of Athenian history are associated with the above "longomural" enclosure: as when, in the beginning of the Peloponnesian war, the plague broke out in the autumn weather among the miserable inhabitants, who were crowded here to suffocation; or, at the end of the same war, when the news came of the defeat on the Asiatic shore, and one long wail went up from the Piraeus, "and no one slept in Athens that night." The result of that victory was, that these long walls were rendered useless by being partially destroyed; and though another Athenian admiral and statesman restored what Pericles had first completed, this intermediate fortification remained effective only for a time. In the incessant changes which fell on Athens in the Macedonian period, they were injured and became unimportant. In the Roman siege under Sulla, the stones were used as materials for other military works. So that when Augustus was on the throne, and Athens had reached its ultimate position as a free city of the province of Achaia, Strabo, in his description of the place, speaks of the Long Walls as matters of past history; and Pausanias, a century later, says simply that "you see the ruins of the walls as you go up from the Piraeus." Thus we can easily imagine the aspect of these defenses in the time of Apostle Paul, which is intermediate to these two writers. What is true of the Agora is still more emphatically true of the Acropolis, for the spirit which rested over Athens was concentrated here. The feeling of the Athenians with regard to the Acropolis was well, though fancifully, expressed by the rhetorician who said that it was the middle space of five concentric circles of a shield, whereof the outer four were Athens, Attica, Greece, and the world. The platform of the Acropolis was a museum of art, of history, and of religion. The whole was "one vast composition of architecture and sculpture, dedicated to the national glory and to the worship of the gods." By one approach only, through the Propylaea built by Pericles, could this sanctuary be entered. If Apostle Paul went up that steep ascent on the western front of the rock, past the Temple of Victory, and through that magnificent portal, we know nearly all the features of the idolatrous spectacle he saw before him. At the entrance, in conformity with his attributes, was the statue of Mercurius Propylaeus. Farther on, within the vestibule of the beautiful enclosure, were statues of Venus and the Graces. The recovery of one of those who had labored among the edifices of the Acropolis was commemorated by a dedication to Minerva as the goddess of Health. There was a shrine of Diana, whose image had been wrought by Praxiteles. Intermixed with what had reference to divinities were the memorials of eminent men and of great victories. The statue of Pericles, to whom the glory of the Acropolis was due, remained there for centuries. Among the sculptures on the south wall was one which recorded a victory we have alluded to, that of Attalus over the Galatians. Nor was the Roman power without its representatives on this proud pedestal of Athenian glory. Before the entrance were statues of Agrippa and Augustus; and at the eastern extremity of the esplanade a temple was erected in honor of Rome and the Emperor. Formed from the brazen spoils of the battle of Marathon, the Minerva Promachus rose in gigantic proportions above all the buildings of the Acropolis, and stood with spear and shield as the tutelary divinity of Athens and Attica. It was the statue which may have caught the eye of Apostle Paul himself, from the deck of the vessel in which he sailed round Sunium to the Piraeus. Now he had landed in Attica, and beheld all the wonders of that city which divides with one other city all the glory of Heathen antiquity. He had seen the creations of mythology represented to the eye, in every form of beauty and grandeur, by the sculptor and the architect. And the one overpowering result was the response from Paul. Now those who were conducting Paul brought him to Athens; and after receiving Paul's command to Silas and Timothy to come to him as quickly as possible, they departed. But while Paul was waiting for them in Athens, he saw that the city was wholly given to idolatry, and his spirit was sorely moved within him. (Acts 17:15 - 16, HBFV). But we must associate Apostle Paul, not merely with the Religion, but with the Philosophy, of Greece. And this, perhaps, is our best opportunity for doing so, if we wish to connect together, in this respect also, the appearance and the spirit of Athens. If the Apostle looked out from the pedestal of the Acropolis over the city and the open country, he would see the places which are inseparably connected with the names of those who have always been recognized as the great teachers of the pagan world. In opposite directions he would see the two memorable suburbs where Aristotle and Plato, the two pupils of Socrates, held their illustrious schools. Their positions are defined by the courses of the two rivers to which we have already alluded. At one spot, near the base of Lycabettus, was a sacred enclosure. Here was a statue of Apollo Lycius, represented in an attitude of repose, leaning against a column, with a bow in the left hand and the right hand resting on his head. The god gave the name to the Lyceum. Here among the groves, the philosopher of Stagirus, the instructor of Alexander, used to walk. Here he founded the school of the Peripatetics. To this point an ancient dialogue represents Socrates as coming, outside the northern city-wall, from the grove of the Academy. Following, therefore, this line in an opposite direction, we come to the scene of Plato's school. But the Academicians and Peripatetics are not the schools to which our attention is called in considering the biography of Apostle Paul. We must turn our eye from the open country to the city itself, if we wish to see the places which witnessed the rise of the Stoics and Epicureans. It is this tenderness of affection which first strikes us, when we turn from the manifold wonders of Athens to look upon the Apostle himself. The existence of this feeling is revealed to us in a few words in the Epistle to the Thessalonians. He was filled with anxious thoughts concerning those whom he had left in Macedonia, and the sense of solitude weighed upon his spirit. Silas and Timothy were not arrived, and it was a burden and a grief to him to be "left in Athens alone." Modern travelers have often felt, when wandering alone through the streets of a foreign city, what it is to be out of sympathy with the place and the people. The heart is with friends who are far off; and nothing that is merely beautiful or curious can effectually disperse the cloud of sadness. If, in addition to this instinctive melancholy, the thought of an irreligious world, of evil abounding in all parts of society, and of misery following everywhere in its train, - if this thought also presses heavily on the spirit, - a state of mind is realized which may be some feeble approximation to what was experienced by the Apostle Paul in his hour of dejection. But with us such feelings are often morbid and nearly allied to discontent. We travel for pleasure, for curiosity, for excitement. It is well if we can take such depressions thankfully, as the discipline of a worldly spirit. Paul traveled that he might give to others the knowledge of salvation. His sorrow was only the cloud that kindled up into the bright pillar of the divine presence. He ever forgot himself in his Master's cause. He gloried that God's strength was made perfect in his weakness. It is useful, however, to us, to be aware of the human weakness of that heart which God made strong. Paul was indeed one of us. He loved his friends, and knew the trials both of anxiety and loneliness. The mere enumeration of the visible objects with which the city of the Athenians was crowded, bears witness (to use Apostle Paul's own words) to their "carefulness in Religion." The judgment of the Christian Apostle agreed with that of his Jewish contemporary Josephus, - with the proud boast of the Athenians themselves, exemplified in Isocrates and Plato, - and with the verdict of a multitude of foreigners, from Livy to Julian, - all of whom unite in declaring that Athens was peculiarly devoted to religion. Replete as the whole of Greece was with objects of devotion, the antiquarian traveler informs us that there were more gods in Athens than in all the rest of the country; and the Roman satirist hardly exaggerates, when he says that it was easier to find a god there than a man. But the same enumeration which proves the existence of the religious sentiment in this people, shows also the valueless character of the religion which they cherished. It was a religion which ministered to art and amusement, and was entirely destitute of moral power. Taste was gratified by the bright spectacle to which the Athenian awoke every morning of his life. Excitement was agreeably kept up by festal seasons, gay processions, and varied ceremonies. But all this religious dissipation had no tendency to make him holy. It gave him no victory over himself: it brought him no nearer to God. A religion which addresses itself only to the taste is as weak as one that appeals only to the intellect. The Greek religion was a mere deification of human attributes and the powers of nature. It was doubtless better than other forms of idolatry which have deified the brutes; but it had no real power to raise him to a higher position than that which he occupied by nature. It could not even keep him from falling continually to a lower degradation. To the Greek this world was everything: he hardly even sought to rise above it. And thus all his life long, in the midst of every thing to gratify his taste and exercise his intellect, he remained in ignorance of God. This fact was tacitly recognized by the monuments in his own religious city. The want of something deeper and truer was expressed on the very stones. As we are told by a Latin writer that the ancient Romans, when alarmed by an earthquake, were accustomed to pray, not to any specified divinity, but to a god expressed in vague language, as avowedly Unknown; so the Athenians acknowledged their ignorance of the True Deity by the altars "with this inscription, TO THE UNKNOWN GOD," which are mentioned by Heathen writers, as well as by the inspired historian. Whatever the origin of these altars may have been, the true significance of the inscription is that which is pointed out by the Apostle himself (Acts 17:23). The Athenians were ignorant of the right object of worship. But if we are to give a true account of Athenian religion, we must go beyond the darkness of mere ignorance into the deeper darkness of corruption and sin. The most shameless profligacy was encouraged by the public works of art, by the popular belief concerning the character of the gods, and by the ceremonies of the established worship. Authorities might be crowded in proof of this statement, both from Heathen and Christian writings. It is enough to say with Seneca, that "no other effect could possibly be produced, but that all shame on account of sin must be taken away from men, if they believe in such gods;" and with Augustine, that "Plato himself, who saw well the depravity of the Grecian gods, and has seriously censured them, better deserves to be called a god, than those ministers of sin." When we turn from the Religion of Athens to take a view of its Philosophy, the first name on which our eye rests is again that of Socrates. This is necessarily the case, not only because of his own singular and unapproached greatness; but because he was, as it were, the point to which all the earlier schools converged, and from which the later rays of Greek philosophy diverged again. The earlier philosophical systems, such as that of Thales in Asia Minor, and Pythagoras in Italy, were limited to physical inquiries: Socrates was the first to call man to the contemplation of himself, and became the founder of ethical science. A new direction was thus given to all the philosophical schools which succeeded; and Socrates may be said to have prepared the way for the gospel, by leading the Greek mind to the investigation of moral truth. The biographer of Apostle Paul has only to speak of the Stoics and Epicureans. They only, among the various philosophers of the day, are mentioned as having argued with the Apostle; and their systems had really more influence in the period in which the Gospel was established, though, in the Patristic and Mediaeval periods, the older systems, in modified forms, regained their sway. The Stoic and Epicurean, moreover, were more exclusively limited than other philosophers to moral investigations, - a fact which is tacitly implied by the proverbial application of the two words to moral principles and tendencies which we recognize as hostile to true Christianity. If Stoicism, in its full development, was utterly opposed to Christianity, the same may be said of the very primary principle of the Epicurean school. If the Stoics were Pantheists, the Epicureans were virtually Atheists. Their philosophy was a system of materialism, in the strictest sense of the word. In their view, the world was formed by an accidental concourse of atoms, and was not in any sense created, or even modified, by the Divinity. They did indeed profess a certain belief in what were called gods; but these equivocal divinities were merely phantoms, - impressions on the popular mind, - dreams, which had no objective reality, or at least exercised no active influence on the physical world or the business of life. The Epicurean deity, if self-existent at all, dwelt apart, in serene indifference to all the affairs of the universe. The universe was a great accident, and sufficiently explained itself without any reference to a higher power. The popular mythology was derided, but the Epicureans had no positive faith in any thing better. As there was no creator, so there was no moral governor. All notions of retribution and of judgment to come were of course forbidden by such a creed. The principles of the atomic theory, when applied to the constitution of man, must have caused the resurrection to appear an absurdity. The soul was nothing without the body; or rather, the soul was itself a body, composed of finer atoms, or at best an unmeaning compromise between the material and immaterial. Both body and soul were dissolved together and dissipated into the elements; and when this occurred, all the life of man was ended. The moral result of such a creed was necessarily that which the Apostle Paul described (1Corinthians 15:32). The essential principle of the Epicurean philosopher was that there was nothing to alarm him, nothing to disturb him. His furthest reach was to do deliberately what the animals do instinctively. His highest aim was to gratify himself. With the coarser and more energetic minds, this principle inevitably led to the grossest sensuality and crime; in the case of others, whose temperament was more commonplace, or whose taste was more pure, the system took the form of a selfishness more refined. As the Stoic sought to resist the evil which surrounded him, the Epicurean endeavored to console himself by a tranquil and indifferent life. He avoided the more violent excitements of political and social engagements, to enjoy the seclusion of a calm contentment. But pleasure was still the end at which he aimed; and if we remove this end to its remotest distance, and understand it to mean an enjoyment which involves the most manifold self-denial, - if we give Epicurus credit for taking the largest view of consequences, - and if we believe that the life of his first disciples was purer than there is reason to suppose, - the end remains the same. Pleasure, not duty, is the motive of moral exertion; expediency is the test to which actions are referred; and the self-denial itself, which an enlarged view of expediency requires, will probably be found impracticable without the grace of God. Thus, the Gospel met in the Garden an opposition not less determined, and more insidious, than the antagonism of the Porch. The two enemies it has ever had to contend with are the two ruling principles of the Epicureans and Stoics, - Pleasure and Pride. Such, in their original and essential character, were the two schools of philosophy with which Apostle Paul was brought directly into contact. Two different impressions were produced by Apostle Paul's words according to the disposition of those who heard him. Some said that he was a mere "babbler," and received him with contemptuous derision. Others took a more serious view, and, supposing that he was endeavoring to introduce new objects of worship, had their curiosity excited, and were desirous to hear more. Two such classes are usually found among those to whom truth is presented. 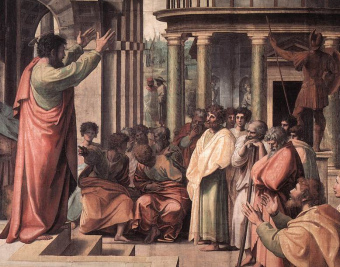 When Paul came among the Athenians, he came "not with enticing words of man's wisdom," and to some of the "Greeks" who heard him the Gospel was "foolishness;" (See 1Corinthians 1:18 - 2:5) while in others there was at least that curiosity which is sometimes made the path whereby the highest truth enters the mind; and they sought to have a fuller and more deliberate exposition of the mysterious subjects, which now for the first time had been brought before their attention. The place to which they took Paul was the summit of the hill of Areopagus, where the most awful court of judicature had sat from time immemorial, to pass sentence on the greatest criminals, and to decide the most solemn questions connected with religion. The judges sat in the open air, upon seats hewn out in the rock, on a platform which was ascended by a flight of stone steps immediately from the Agora. On this spot a long series of awful causes, connected with crime and religion, had been determined, beginning with the legendary trial of Mars, which gave to the place its name of "Mars' Hill." A temple of the god, as we have seen, was on the brow of the eminence; and an additional solemnity was given to the place by the sanctuary of the Furies, in a broken cleft of the rock, immediately below the judges' seats. Even in the political decay of Athens, this spot and this court were regarded by the people with superstitious reverence. It was a scene with which the dread recollections of centuries were associated. It was a place of silent awe in the midst of the gay and frivolous city. Those who withdrew to the Areopagus from the Agora, came, as it were, into the presence of a higher power. No place in Athens was so suitable for a discourse upon the mysteries of religion. We are not, however, to regard Apostle Paul's discourse on the Areopagus as a formal defense, in a trial before the court. The whole aspect of the narrative in the Acts, and the whole tenor of the discourse itself, militate against this supposition. The words, half derisive, half courteous, addressed to the Apostle before he spoke to his audience, "May we know what this new doctrine is?" are not like the words which would have been addressed to a prisoner at the bar; and still more unlike a judge's sentence are the words with which he was dismissed at the conclusion, "We will hear thee again of this matter." We may, indeed, admit that there was something of a mock solemnity in this adjournment from the Agora to the Areopagus. The Athenians took the Apostle from the tumult of public discussion, to the place which was at once most convenient and most appropriate. There was every thing in the place to incline the auditors, so far as they were seriously disposed at all, to a reverent and thoughtful attention. It is probable that Dionysius, with other Areopagites, were on the judicial seats. And a vague recollection of the dread thoughts associated by poetry and tradition with the Hill of Mars may have solemnized the minds of some of those who crowded up the stone steps with the Apostle, and clustered round the summit of the hill, to hear his announcement of the new divinities. In this scene Apostle Paul spoke, probably in his wonted attitude, "stretching out his hand;" his bodily aspect still showing what he had suffered from weakness, toil, and pain; and the traces of sadness and anxiety mingled on his countenance with the expression of unshaken faith. Whatever his personal appearance may have been, we know the words which he spoke. And we are struck with the more admiration, the more narrowly we scrutinize the characteristics of his address. To defer for the present all consideration of its manifold adaptations to the various characters of his auditors, we may notice how truly it was the outpouring of the emotions which, at the time, had possession of his soul. The mouth spoke out of the fulness of the heart. With an ardent and enthusiastic eloquence he gave vent to the feelings which had been excited by all that he had seen around him in Athens. We observe, also, how the whole course of the oration was regulated by his own peculiar prudence. He was placed in a position, when he might easily have been insnared into the use of words which would have brought down upon him the indignation of all the city. Had he begun by attacking the national gods in the midst of their sanctuaries and with the Areopagites on the seats near him, he would have been in almost as great danger as Socrates before him. Yet he not only avoids the snare, but uses the very difficulty of his position to make a road to the convictions of those who heard him. He becomes a Heathen to the Heathen. He does not say that he is introducing new divinities. He rather implies the contrary, and gently draws his hearers away from polytheism by telling them that he was making known the God whom they themselves were ignorantly endeavoring to worship. Others of those who were present on the Areopagus said, with courteous indifference, that they would "hear him again on the subject." The words were spoken in the spirit of Felix, who had no due sense of the importance of the matter, and who waited for "a convenient season." Thus, amidst the derision of some, and the indifference of others, Apostle Paul was dismissed, and the assembly dispersed. But though the Apostle "departed" thus "from among them," and though most of his hearers appeared to be unimpressed, yet many of them may have carried away in their hearts the seeds of truth, destined to grow up into the maturity of Christian faith and practice. We cannot fail to notice how the sentences of this interrupted speech are constructed to meet the cases in succession of every class of which the audience was composed. Each word in the address is adapted at once to win and to rebuke. The Athenians were proud of every thing that related to the origin of their race and the home where they dwelt. Apostle Paul tells them that he was struck by the aspect of their city; but he shows them that the place and the time appointed for each nation's existence are parts of one great scheme of Providence, and that one God is the common Father of all nations of the earth. For the general and more ignorant population, some of whom were doubtless listening, a word of approbation is bestowed on the care they gave to the highest of all concerns; but they are admonished that idolatry degrades all worship, and leads men away from true notions of the Deity. That more educated and more imaginative class of hearers, who delighted in the diversified mythology which personified the operations of nature and localized the divine presence in sanctuaries adorned by poetry and art, are led from the thought of their favorite shrines and customary sacrifices, to views of that awful Being who is the Lord of heaven and earth, and the one Author of universal life. And when the Stoic heard the Apostle say that we ought to rise to the contemplation of the Deity without the intervention of earthly objects, and that we live and move and have our being in Him - it might have seemed like an echo of his own thought - until the proud philosopher learnt that it was no pantheistic diffusion of power and order of which the Apostle spoke, but a living center of government and love - that the world was ruled, not by the iron necessity of Pate, but by the providence of a personal God - and that from the proudest philosopher repentance and meek submission were sternly exacted. Above all, we are called upon to notice how the attention of the whole audience is concenterd at the last upon Jesus Christ, though His name is not mentioned in the whole-speech. Before Apostle Paul was taken to the Areopagus, he had been preaching "Jesus and the resurrection;" (Acts 17:18) and though his discourse was interrupted, this was the last impression he left on the minds of those who heard him. And the impression was such as not merely to excite or gratify an intellectual curiosity, but to startle and search the conscience. Not only had a revival from the dead been granted to that man whom God had ordained - but a day had been appointed on which by Him the world must be judged in righteousness. Of the immediate results of this speech we have no further knowledge, than that Dionysius, a member of the Court of Areopagus, and a woman whose name was Damaris, with some others, were induced to join themselves to the Apostle, and became converts to Christianity. Who was resurrected right after Jesus? Is God's kingdom within each person?